I have to say that I was so proud today to be Chair of lil ole Ryton GC. 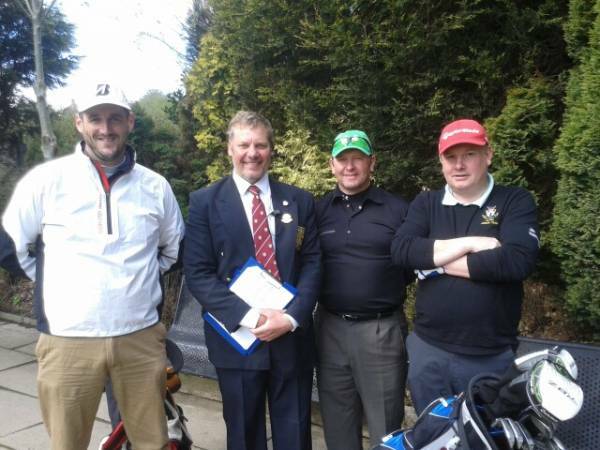 We hosted the County Qualifier in which over 100 of the counties best golfer took part and "enjoyed" what we have to offer in the Vale of Clara! The course was in magnificent order thanks to the very hard work this week of Pop and the lads. The greens are back to their spectacular best. Every player i spoke to stated that their greens were not up to scratch (save Heworth which are "a little quicker") and that it was a pleasure to play on such true and even paced surfaces. I couldn't help having my photo taken with 3 players who teed off at the same time since we all shared the same forename of "Paul"! It has to be said yet again that considering the number of Category 1 players playing, not a single player was able to beat our course. The best score of the day was indeed 71! Good but no cigar! I hope all of our members enjoyed their "courtesy of the course" around the county today. Am I the only member of the club who "embelishes" their rounds on Howdidido.com? Answer YES! Why not create yourself some interesting statistics this year by inputting your GIR's. Putts, Fairways hit, etc etc into the howdidido website after your competitive rounds.Its very easy to do and very revealing! Here are some of my statistics based on 69 rounds of golf. Not great reading I know but certainly food for thought. A pinch and a punch for the first of the month! Doesn't time fly? Here we are in May! The club is now officially in full swing! I must appologise for my lack of missives. Work, work and well ..... golf basically have been the problem. But life goes on and I will certainly be available more during the summer months I hope. The recent highlights have been the opening of the Ryton Golf Shop (well done Ciaran), the satelite TV, the clubhouse has been decorated, we are starting to hold social events at the club again, the changing of the pumps at the bar, the slight change in the weather and so many happy smiling new (and of course old) faces at the club. The teams are getting going! The Hadrian League starts tonight, the Clarke Cup is being played on Monday at Bishop Aukland. The Club is hosting a County Qualifier on Saturday. Many members have taken the opportunity to visit other clubs on the 4th! Its all happening in club competitions with the qualifiers nearly complete and the Fedex in full flow! Exciting! All we need now is for a little bit of growth and the course will look stunning. Stripes on our lush fairways, the greens shawn to their perfect length, the whispy rough emerging, leaves on the trees and just watch the 4 greenkeepers come into their own. Its all looking good at present.